RemoveAdsTube is a suspicious application that might enter your computer without your permission and start showing various commercial advertisements. Actually, it is not surprising that this application displays ads because it is classified as an advertising-supported application. These programs just seek to advertise particular products and services as well as drive traffic to different websites. As it can be seen, RemoveAdsTube will not help you to get rid of ads that appear on YouTube because it just seeks to lure you into clicking on commercials that it generates. As the research has shown, they will flood your Internet Explorer, Google Chrome, and Mozilla Firefox browsers. As a consequence, you will see them no matter which browser you use. Unfortunately, it seems that ads might not only disrupt your browsing session, but also expose you to threats, which is why we advise that you get rid of RemoveAdsTube as soon as possible. Follow the instructions placed below the article and you will delete this adware without any difficulties. The researchers of pcthreat.com have found out that RemoveAdsTube might randomize its name. It means that it might be more difficult to detect and remove it. In this sense, RemoveAdsTube is very similar to such applications as RightCoupon, TicTacCoup, LuckyCoupon, RealDeal, and other software. Thus, if you ever detect any of them on your system, you should definitely get rid of them as soon as possible. In order not to allow similar programs enter the system without your permission in the future, you should never click on fake buttons placed on Torrent or P2P websites. In addition, you should always find out whether the program is reliable before installing it on the system as well. 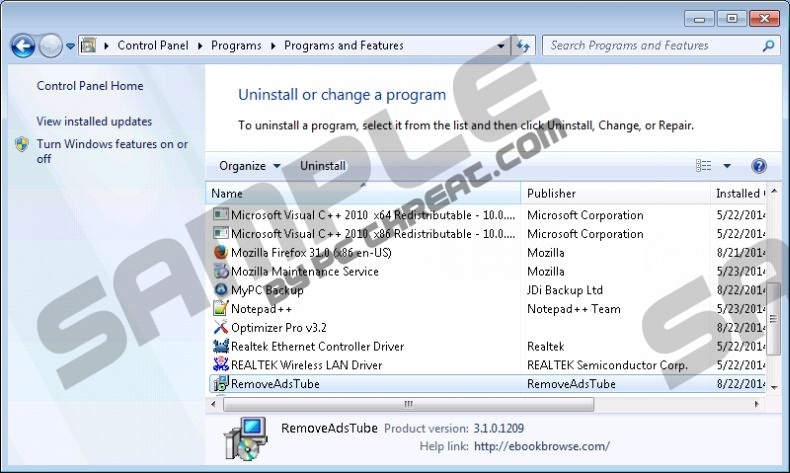 As RemoveAdsTube is an adware program, it will definitely not stop displaying various commercial advertisements; thus, you should definitely get rid of it as soon as possible if you do not want to cause harm to your system. You should know that malicious software might easily enter your system if you let RemoveAdsTube stay on your computer. You might click on a single advertisement and then be routed to corrupted websites full of malware. As you can see, it is very risky to keep this undesirable software on the system, which is why you should remove it as soon as possible. The easiest way to get rid of RemoveAdsTube is to acquire an antimalware tool and then launch the scanner. Make sure that your security software is trustworthy because there are plenty of undesirable applications on the internet. If you ask our opinion, we believe that you should use SpyHunter because this program is going to remove different kinds of infections in a blink of an eye and protect your PC from other undesirable applications. Click on the Start menu icon to open it. Select the application that needs to be erased. Quick & tested solution for RemoveAdsTube removal.